The Deluxe Educational Loom Kit has 3 columns of 13 pegs, for a total of 39 pegs. The columns are held together with 4 base units and the loom can be combined with additional looms either side by side or end to end.. 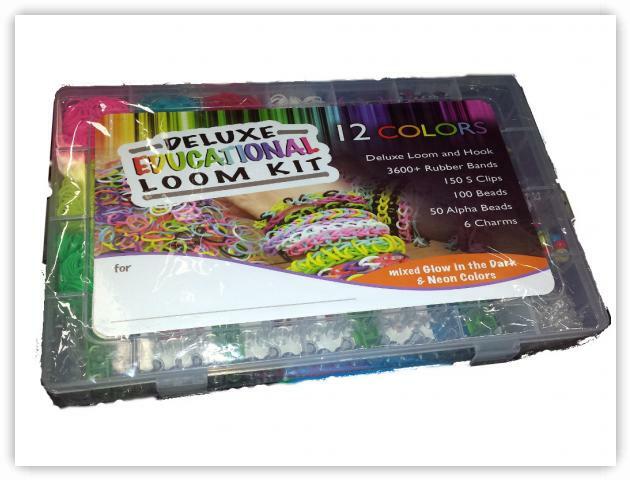 The kit comes with the loom, 2x loom hooks, 150 "S" Clips, and 3600+ assorted elastic bands (including glow in the dark and neon colors), 100 beads, and 6 charms. The kit is available online and in a few specialty stores. As an added bonus, it include a nice storage case with the loom.